Mercury (chemical symbol Hg) is a poisonous, heavy metal. It is also known as quicksilver, because it is the only metal that is liquid at room temperature. Mercury occurs naturally in the environment, and everyone is exposed to very low levels in air, water, and food. But exposure to higher doses of mercury can harm your health. Mercury is especially harmful to the developing nervous system of a fetus or young child, as they are much more sensitive to mercury than adults. Mercury can permanently alter the developing nervous system. Why is mercury a health concern? Eating mercury-contaminated fish is the primary route of exposure for most people. Mercury can enter and accumulate in the food chain, building up in fish, shellfish and animals that eat fish. Find out more from the Department of Health’s Fish Consumption Advice website. Breathing mercury vapor that has been released when mercury is spilled or mercury-containing products break is another source of exposure. Inhalation of mercury vapor can be dangerous, so it is important to prevent spills and clean them up immediately if they do happen. How can I reduce mercury exposure in my home? The best way to protect you and your family from mercury exposure is to remove mercury-containing products and devices from your home. Buy mercury-free products for use in your home. Minnesota law requires that all mercury-containing products be labeled as such. Mercury-free alternatives are available for any product that would be used in the home. Stop using and if necessary replace mercury products that can break and cause exposure. If you have items such as thermometers, barometers, etc. that are easily broken or release mercury when used, stop using them and take them to your local household hazardous waste facility for proper disposal. Replace them with mercury-free alternative products. Conserve energy. 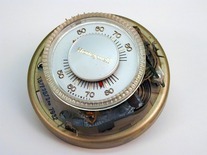 Using less energy at home will not only save you money, it will also help reduce mercury pollution. When electrical power plants burn coal, trace amounts of mercury from the coal are released to the atmosphere. Conserving energy reduces the amount of coal that power plants burn. Properly store and dispose of mercury-containing products and devices. State law requires the recycling of all mercury-containing items. Take all compact and other fluorescent bulbs (i.e. CFLs), and other mercury-containing items to the nearest household hazardous waste collection site to be recycled. Find your household hazardous waste site. Many home improvement stores accept spent fluorescent tubes and bulbs for recycling. Check with your local retailer or go to www.earth911.org. What do I do if a mercury-containing device breaks or spills at home? Call the Minnesota Duty Officer at 800-422-0798 or 651-649-5451. Someone is available 24-7 to answer calls. Print and keep handy the directions in the Cleaning Up Mercury Spills in the Home fact sheet. To find out more, go to the MPCA’s frequently asked questions about mercury. What can you do to help Minnesota's environment? 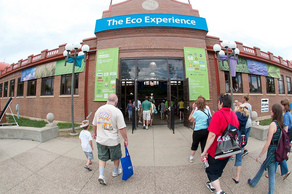 Visit the Eco Experience! This exhibit at the Minnesota State Fair brings together organizations, ideas, and hands-on activities to show what you can do at home to help the environment. It’s open August 25 through September 5 at the 2011 Minnesota State Fair. During your visit,you’ll experience three model green homes, electric vehicles, native landscaping, local farmers, recycled-content products, and lots of renewable energy demonstrations. Come with your questions, leave with your answers. Find out what electric vehicles are and why they might be a right solution for your future transportation needs at this Electric Car Workshop. September 10, 1pm, Midtown Global Market (Minneapolis). Learn fascinating facts about Mushrooms and More with expert Rosanne Healy as you hunt through the Mississippi River Gorge Regional Park. September 10, 9 - 11am, Bell Museum of Natural History, (Minneapolis). Join us for a Minnesota premier of the acclaimed documentary film, Green Fire: Aldo Leopold and a Land Ethic for Our Time. September 16, 7pm, Bell Museum of Natural History, (Minneapolis).